Linda Ross believes that your skin is a reflection of what is going on inside of your body emotionally and physically as well as what you do to it topically. While external factors can exaggerate skin problems, the source comes from within. Linda believes that in order to have the beautiful skin you deserve, you have to work both internally and externally. 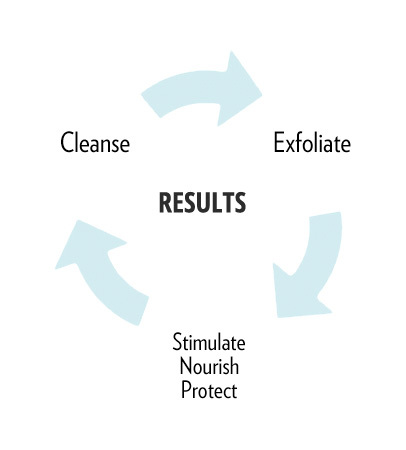 Linda's skin care philosophy is based in the European methods that she has studied. Her facials are thorough yet relaxing. she does not believe in harsh treatments and avoids products that thin the skin. you will also not find a magic machine in her office, however your skin will always look better when you leave her chair compared to when you walked in. She tells her clients to think of the skin as a life long journey verses a short term race - there are no quick fixes for the type of results Linda promises. If you follow her advice and embrace her skin care philosophy your skin will be glowing in 90 days. Our food source has changed dramatically over the years. Steroids, hormones, and antibiotics given to animals and the pesticides on our fruits and vegetables are damaging our immune system. Bottom line, we are not getting the nutrients we need from our food. Supplements that benefit all skin types and help the aging process include: Colostrum, Lysine, Sulfur, Bilberry, and Grape Seed Extract. Your body does all of its repair work while you sleep so please get your 8 hours. While you cannot eliminate stress in your life you can control how you deal with it. Since the body is primarily water we need to drink plenty of it. To make water more exciting add lemon to help balance your pH level or ginger that aids in digestion. Carbonated beverages are not recommended as they do nothing but put additional stress on your body...this includes carbonated water. Skin is the largest organ in the body. Exercising helps to speed up the circulation of blood flow and allows the toxins to be removed from the body and congestion in the skin. Additionally, it makes you feel good! Avoid ingredients that clog pores like lanolin, mineral oil, wax or parafin of any type, anything that starts with petro and anything starting with Dimethicone (is derived from Silicone) & Silicone. Necessary to clean and minimize pores size.